Artists for Local Agriculture (AFLA) is exactly what it sounds like: local artists who gather together for one specific passion—urban farming. Combining agriculture with art, AFLA has created a substantial community that is continuing to grow. I’ve gotten in touch with LeAundra Jeffs who is hosting an upcoming benefit show for the organization, to get some insight on what AFLA is all about. LeAundra Jeffs: AFLA is a local non-profit, fiscal agent of Revolution United that seeks to simultaneously support sustainable urban farming and a cohesive artistic community in Salt Lake. This dual purpose uses the community symbiosis fostered by creating and enjoying art to support both local agriculture and business. SLUG: How and when did it form? Jeffs: I am not an agent of AFLA. I got the idea for hosting benefit shows after working on the board of directors for Revolution United. The experience there put me in touch with many non-profits around the city. My involvement in the local music scene and this knowledge of non-profits work so well together to create social justice oriented events, that to not use the connections seemed wasteful. SLUG: What are some of the events and programs that AFLA holds? Jeffs: AFLA hosts community art and gardening nights and local music and art shows at their gardens as well as yoga classes. They have a composting and soil renewal workshop coming up on August 27th at Centro Civico Mexicano. SLUG: Why do you feel that what you’re doing is important? Jeffs: I think that so many people in Salt Lake City and elsewhere are calling for change in their communities. The mindset of supporting local businesses and culture only works if individuals are putting effort into making these habits and transformations happen. The combination of music and a cause is so important because music is a unifying factor. People are willing to put effort into enjoying entertainment so pairing a concert with a beneficiary is a fruitful way to have fun while supporting your community members and your interests. SLUG: How do you expect to grow? Jeffs: In the near future I will be hosting more benefit shows with a rotation of beneficiaries. The next one is scheduled in October and I am currently in the process of recruiting another non-profit. If this idea takes off and is successful I have spoken with the Woodshed about having a monthly benefit night that I will host. SLUG: What bands do you have playing for the show on the 21st? How did you decide on what bands to play? Jeffs: The performers will be The Nods, Jail City Rockers, Speak Uneasy, and Nix Beat will be D.J.ing. This first show is going to be a punk show with bands from different arms of the genre. I want to have a cohesive lineup for every show sticking generally within the same type of music as their relative performers. I decided to do punk for the first show after seeing The Nods at Diabolical earlier in the summer. I was impressed and decided I wanted them to be my first headliner. Jail City Rockers caught my eye soon afterward and Speak Uneasy fell perfectly into place as well. SLUG: Where will all of the proceedings go? Jeffs: All proceeds from the benefit show will go directly to AFLA at the end of the evening. All future shows will have proceeds go directly to their beneficiaries as well. The benefit show will take place at the Woodshed on the 21st of August. 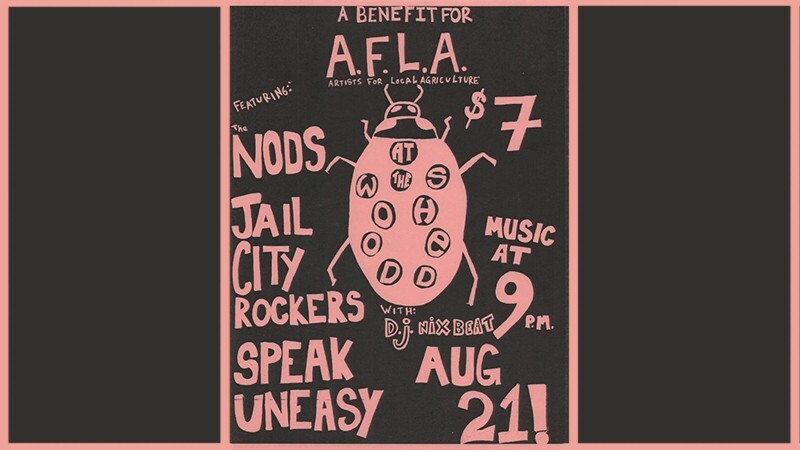 As mentioned The Nods, Jail City Rockers, Speak Uneasy, and DJ Nix Beat will all be performing. To find out more about AFLA and how to get involved you can check out their Facebook page as well as their website. Check them out and learn more about your local agricultural community.